Lawn bowling is a relatively easy game to play but it is played at various skill levels. However, the game is played in the same manner whether it be in competition or at a club level and can be enjoyed by everyone. 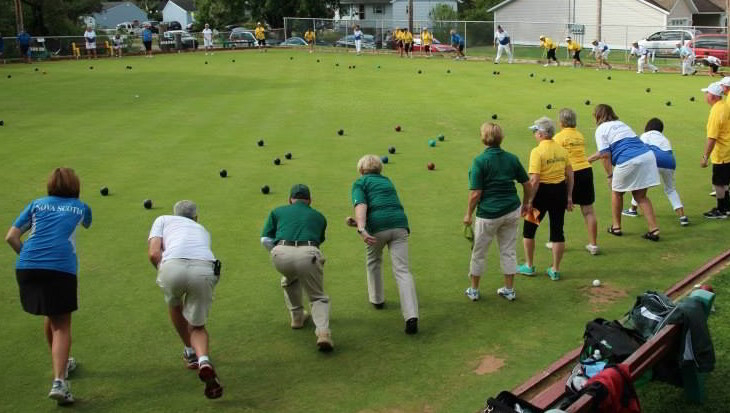 The above covers the basis for how the game of lawn bowls is played. There are other rules or variations to the above which apply. These serve as guidelines to playing the game and makes the game even more interesting and challenging. Like anything else a person does the more you play the game the more one understands the rules and improves their skill level. Simply show up at the club on Monday and/or Wednesday evenings at 7 pm wearing flat soled footwear (no heels). All other equipment (bowls, etc.) is provided. Names are drawn in a way to ensure each team consists of experienced and inexperienced bowlers. New membership for May to September next year is $75.00 for the season. Want to have some fun? Give lawn bowling a try!